Scout Cosmetics is an Australian Organic Makeup Brand with clean ingredients and I was intrigued by all the chubby pencils. Pencils with cream products are just SO easy to use, perfect for real people, mums, travellers and others having a life to live and not hours to spend on their makeup. But even as a pro-artist these products come in handy and are quick to sanitize with a sharpener and won't require brushes. I tried the Pure Colous Lip Liner pencil in Pink which doubles as a beautiful Eyeshadow Pencil and Lipstick. Acutally, you can use them on the cheek too, if the colour is suitable. The Eyeliner Chubbi Pencil and the Corrector Pencils were a real hit too. The texture and pigment are fantastic in all of them. Definitely professional quality. They are easy to blend and have a good staying power for a cream product. All these products are vegan too! This was my first time trying Scout Cosmetics and I will totally be happy to try out more from this range and recommend it! You know I only recommend the best of the best in natural beauty to you, don't you? 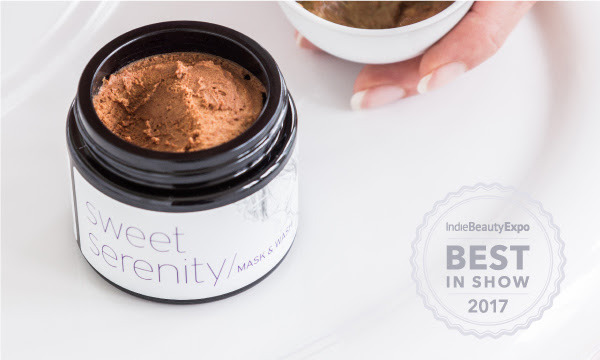 MAX&ME Sweet Serenity Mask&Wash just won Best In Show at the Indie Beauty Expo USA. I was showing you how to use it and reviewed it in my home facial video here and kept mentioning it in different posts. Now you know why! It's a winner. Just saying! I somehow managed to record this just before Christmas, but with some technical issues it took days to upload. However, it's up and live now, just in time for NYE. I hope you enjoy this little tutorial. A great start to the new year and all the glow & happiness from us to you! Thank you for reading and following along, I am looking forward to 2018! Have you seen PATCH? No? It's a really great organic & toxin-free alternative to your good old band-aid. I just got these cuties sent and had to share! Faye just got to the age of bumps & boo-boos, trying to balance on her feet & crawling, scooting around. I remember quite clearly all the scraped knees of my own childhood and I know that these strips will come in handy for all the years to come. THIMEROSAL FREE - MERTHIOLATE FREE - LATEX FREE . Which makes them hypoallergenic and safe to use on little ones and adults alike. And they really did a great job on the outside, too! The brown recycled paper tubes with sleek typography are just SO beautiful to look at! Packaging absolutely nailed. I will even keep them around for Faye to play with. There is a kids version of the cutest Panda print, which to be honest, is totally what I would choose to wear myself. This one is enriched with Coconut Oil, which means no more red marks or nasty reactions from plasters. These are super soft and easy to remove, but they do stick very well at the same time. Created for the future eco warriors. The black strip version with activated charcoal, which helps wound healing especially for bites, splinters & grazes and a Tan strip version, enriched with Aloe Vera, they speed up wound healing and are perfect for burns, blisters, grazes & scrapes. Cool, huh? I am overall quite inspired how these guys took such a simple, yet boring product and really turned it around offering a safe, healthy, eco-friendly & very well designed product! Thumbs up from this Mama and highly recommended! Here is to all our adventures!